If you read the first part of this series, you’d have learned that I started a new company called Refined Auto Studio. The goal of this company was to create a one-stop shop for high-end automotive aesthetics, (wrap, tint, powder coating, restoration), but also rebrand, offering a new service to the industry – aesthetic restoration. This company is high end, something I wanted to stress a ton. Our services are priced as such, so bringing an entire experience to the client in my opinion, was a crucial key to the business. An often looked over area of an automotive business is the shop design, offices, cabinets, etc. Remember, we make our money in aesthetics, so our shops should reflect this to our clients! This visual communication is a great first step in building trust with the owner of the vehicle. I think the one to nail this the most was Matt Mooreman of Obsessed Garage. A truly OCD detailing figure that has mastered the art of a perfect garage/shop setup. 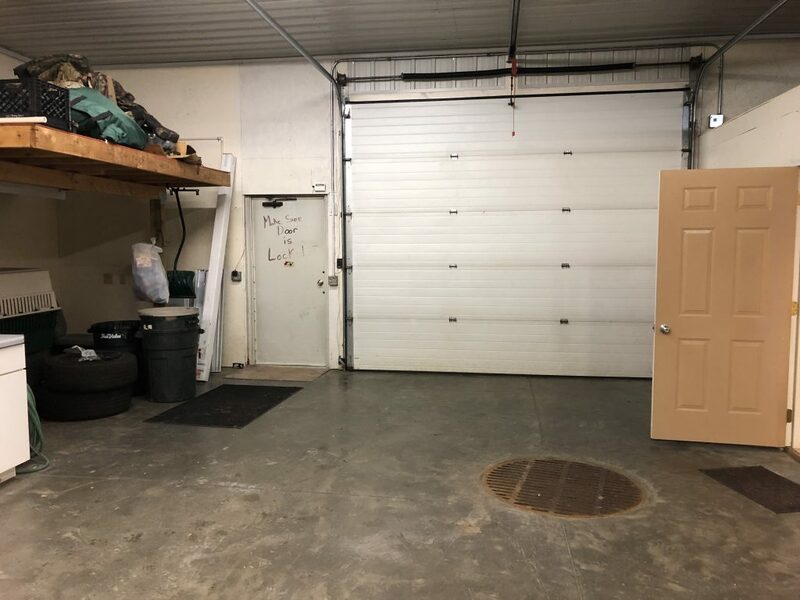 Although my shop and office are likely not quite at that Obsessed Garage level, It’s been enough to get my point across as a high-end shop as well as create a nice area to work in, or even just hang out in. 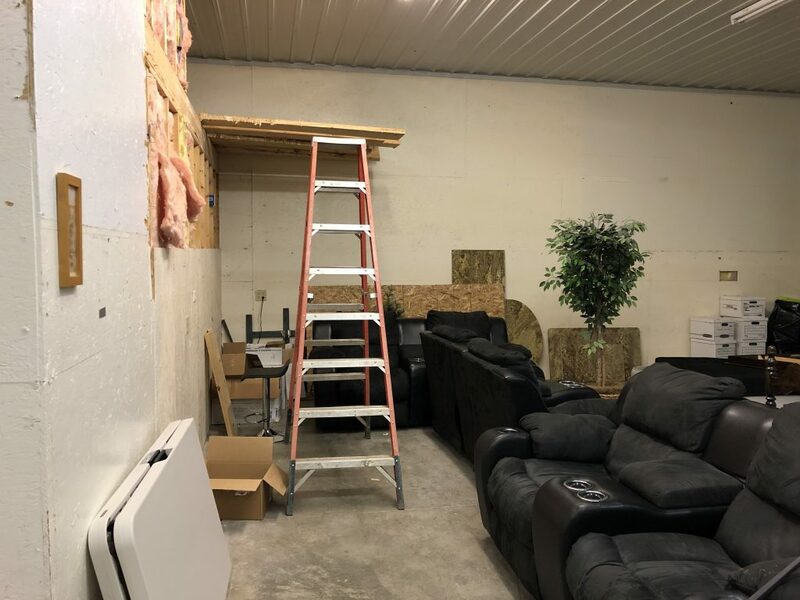 I spend a lot of my time at the shop, so creating a nice environment for not only my clients, and myself, but also the guys that work with me was very important. To begin, here are some pictures of where it started when I was originally touring the place. 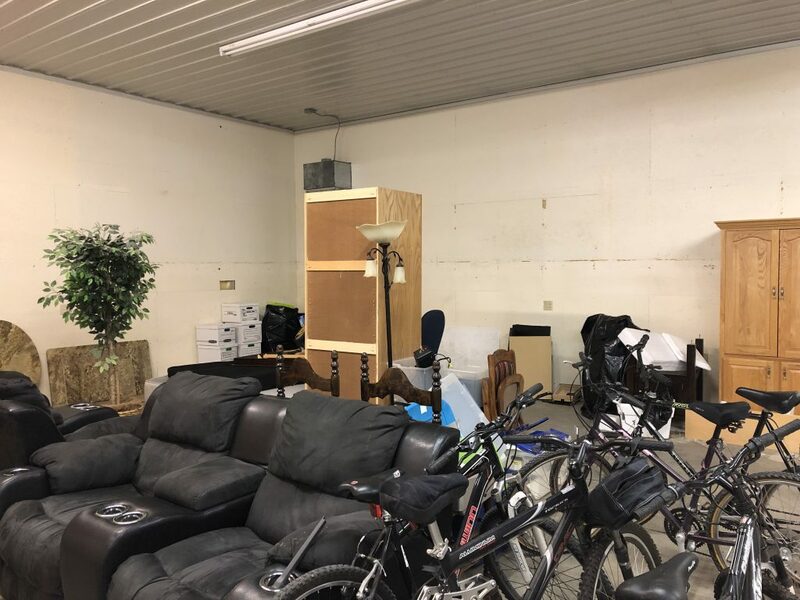 It was essentially being used as a storage unit. 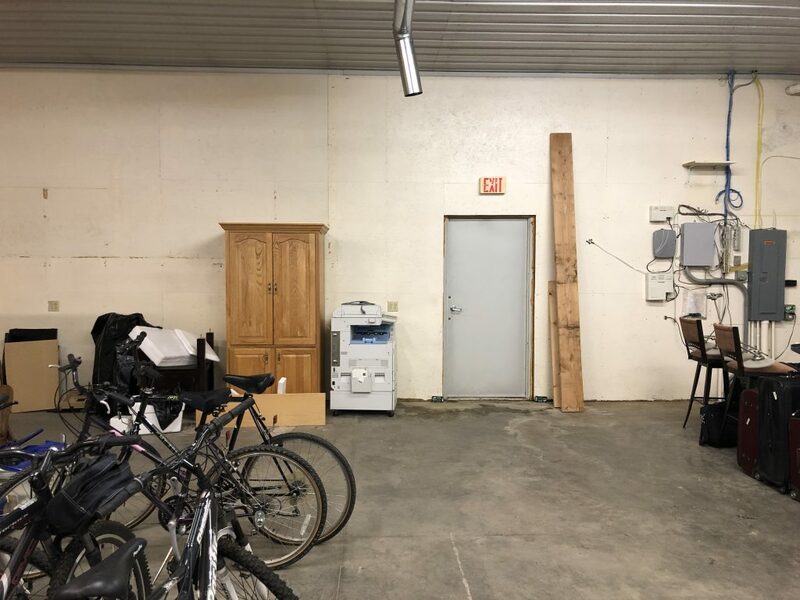 My biggest concerns for the shop was the lack of discrete wiring and electrical, office paint color choices, mismatched white paint, wood shelves, and OSB on the walls. Drywall in my shop was pretty high on the list, but this place had nearly everything else, including a great location, so I went ahead with it. Apologies on the iPhone pics in this article! 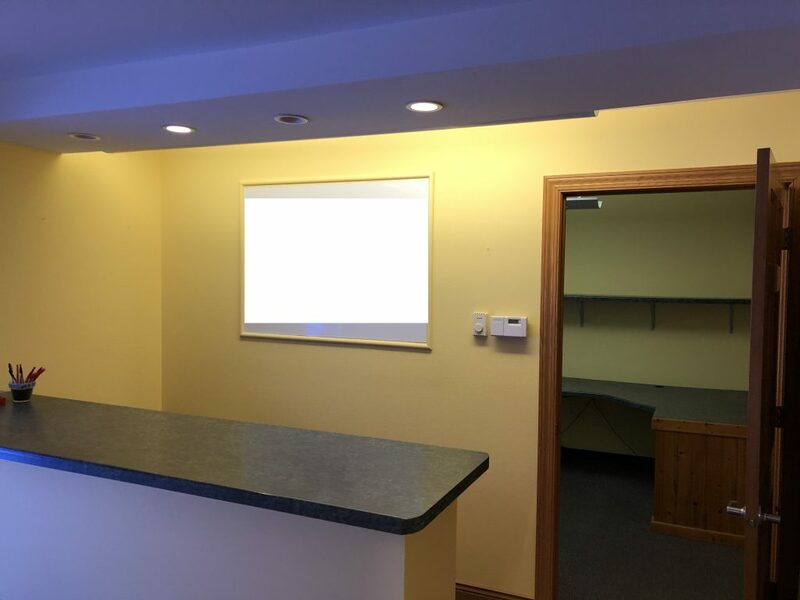 Pictured above is before moving into the shop space, 2/3 offices, and the walk-in entryway. 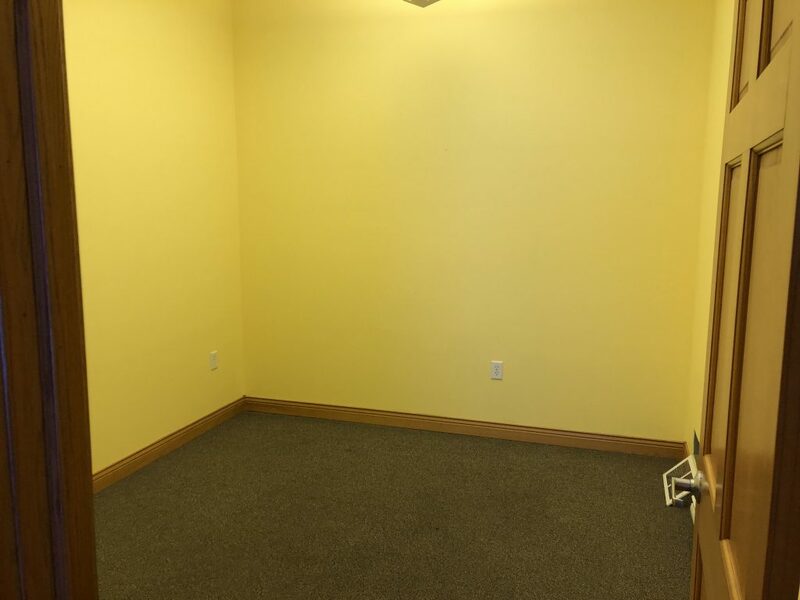 The office space was nice, but painted a very bright yellow that wasn’t doing it for me. There are 3 “office” spaces when you walk-in, a walk in entry and front desk room as well. 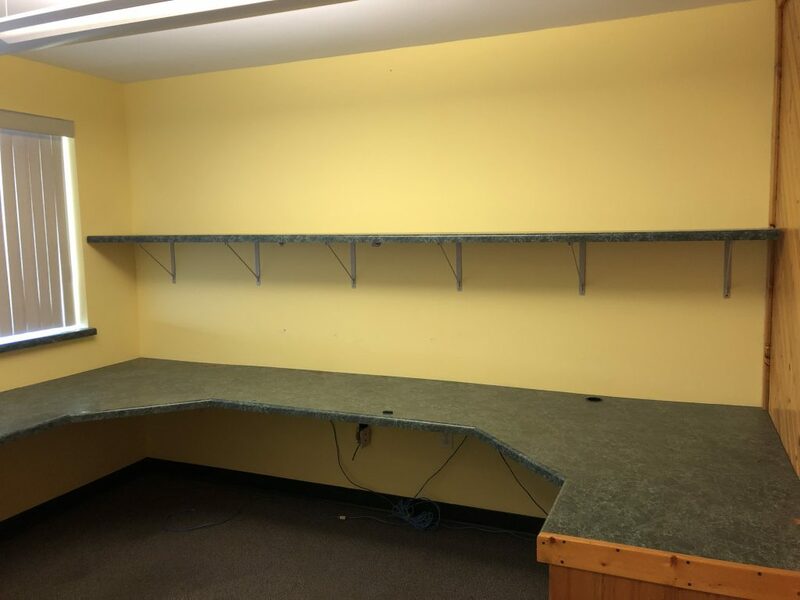 I will be turning these into an office for the plotter and a media/design computer, a lounge type area, and a conference/design room, showcasing many samples of different wrap colors, powder colors, tint, etc. I will also be hanging a TV in this room in hopes to use for client renders. More to come on this in the future, as it’ll be a continual work in progress. Each room got new paint and is now awaiting cleanup and stuff moved into them. 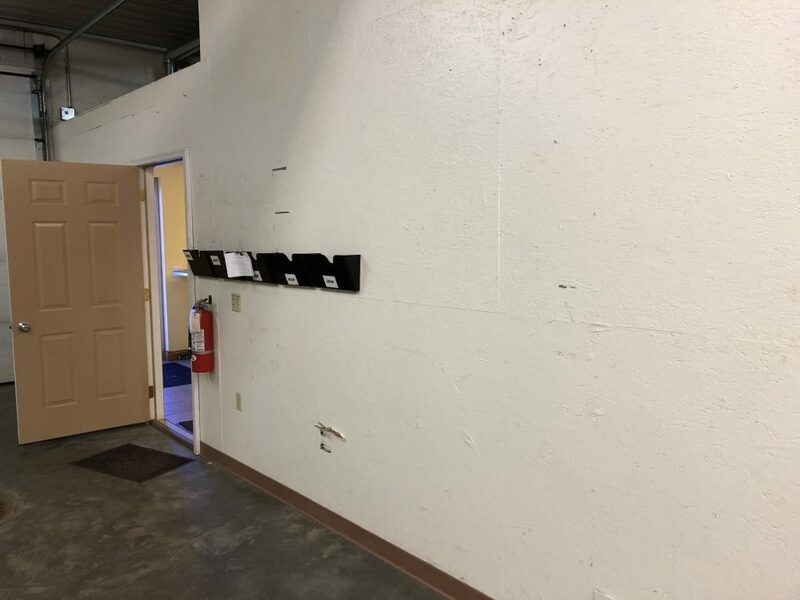 The shop received some paint work in the main work bays, lighting, clear coated floor, cabinets, and other organizational pieces. I need to order some more lights, flags, and I have some vinyl work to do on the cabinets as well as a big logo on the wall. The wash bay needs to be cleaned up and some accessories added to streamline the wash process. Paint – Never underestimate the value of a fresh coat of paint. It really gave the shop and offices some life for minimal money. I prefer white/gray/black, for the darker neutral, high end/luxury feel. It also helps in the shop with lighting by not reflecting a ton and washing out the space. 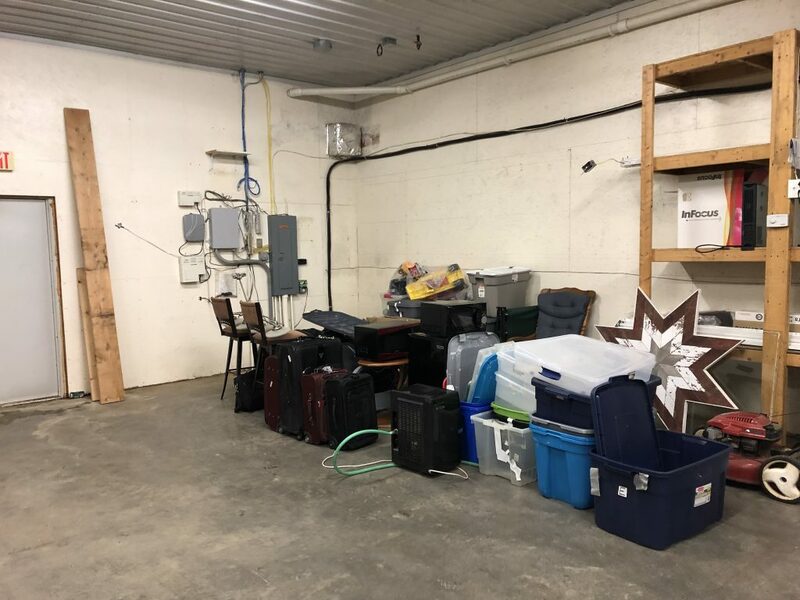 Cabinets – This was probably the most under estimated thing I had purchased throughout this experience at the new shop. The space, room for organization and tools, and the aesthetics of a cabinet set in the shop seriously changed the feel of the place. However, I custom built a budget set from Menard’s and that put me in a world of hurt… Lesson learned; buy quality cabinets. Their demo set hooked me, and built at only $1100, I thought it was quite hard to beat, at the time. Square Footage – Bigger isn’t always better, but when you’re working on cars, it kind of is. My unit is about 2200 sq ft. The shop is about 1800ish of that, including the bathroom. I can easily fit 4-5 cars and have enough space to work on them, but it VERY quickly filled up when I started moving things in. Get the biggest one you can afford. You will likely outgrow the space quickly. Vinyl Branding – Vinyl is a very inexpensive way to add design, color, but most importantly, branding to your space. We will be using tons of this in the future. From wrapping the countertops, to cutting out our logos and others for cabinets, walls, doors, etc. Create a good relationship with your local sign shop, or buy yourself a plotter. Flooring – Flooring is a kicker. It’s expensive. 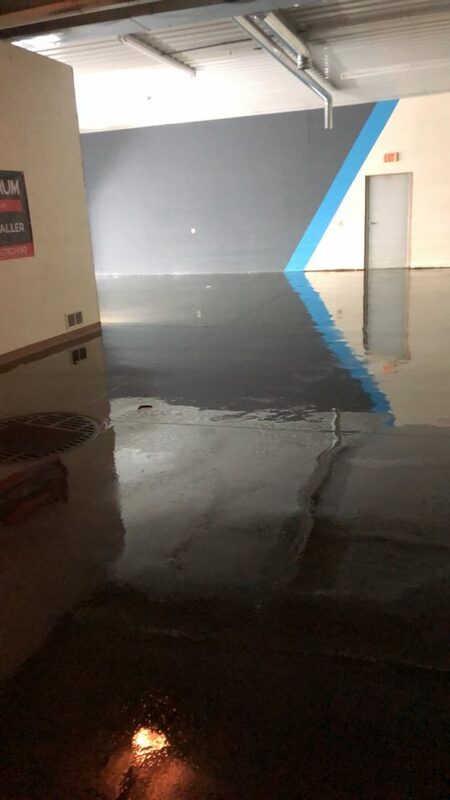 Luckily, I have a close family member who works in concrete and was able to clear coat my floor. I would not recommend this as after just a few weeks, it has degraded quite badly. The wash bay is nearly bare already, it scratches easily, and there are tire marks all over. Looks great at first and is much better than nothing at all, but if I had paid significant money for it, I would be very disappointed. I will continually write a shop update post every few months to let you know what’s the latest and greatest, and what I’ve learned from it. Some after pics will be posted in the next post, as the shop is currently filled with garbage and vinyl wrap backing! (We don’t yet have a dumpster.) 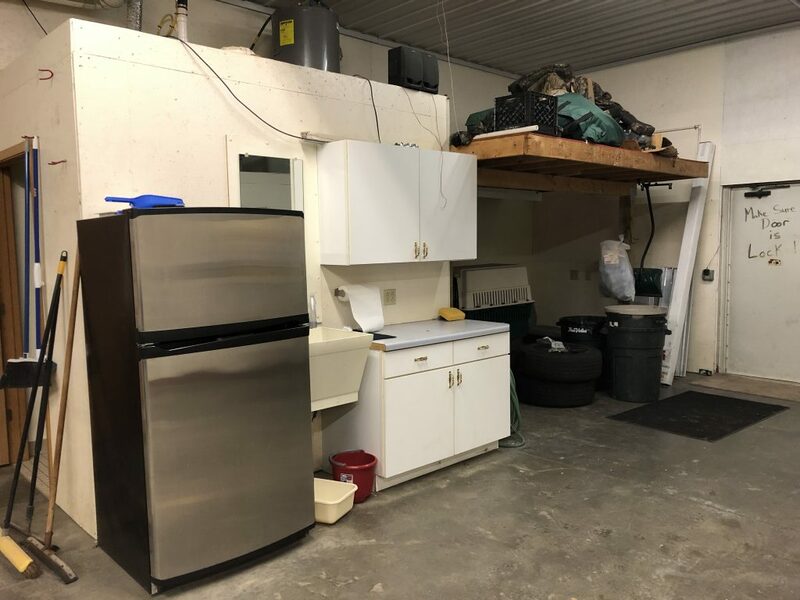 Hopefully, it helps you make decisions on what you’d like to do for your own shop or garage. In the next update, you’ll likely see a Quickjack system, some more vinyl branding work, all raw wood painted in the shop, potentially a new floor, office updates, and probably some other misc. things. Also – much better photography. In the moment, I wasn’t thinking anything of it, but I really wish I would’ve gotten some nice pictures! In the meantime, feel free to add us on Instagram or Facebook: @refinedautostudio, or visit our website, refinedautostudio.com. Looking good so far bro! Keep up the great work! I can’t wait to see how she looks throughout the summer months! Thank you sir! Looking forward to upgrades along the way as well. I appreciate you sharing your experience, so many detailers have to work through these same situations. I know you poured a ton of work into this and I’m thrilled it’s coming out so good. I look forward to seeing the next post in this series! It’s slowly coming together. Been a long time in the making. Trying to build the image in my head is difficult! Ha. Hi, I don’t understand your comments on the cabinets. Were you happy or unhappy with the cabinets? What was the problem/advantages with custom builds? What would you prefer for finishing your floors since the concrete coating did not hold up to your traffic? I’ve heard a cushioned surface is best especially on your knees and back. Thanks for letting us be part of your build process. We can learn from your mistakes and successes. I was unhappy overall with the cabinets, but that was mostly my local Menard’s doing. Between not placing the order at all, placing it incorrectly, having poorly manufactured cabinet faces, broken pieces, it was a definite process to get those things together. But, I paid about $1100 for the entire set, so for custom cabinets, that’s extremely cheap. Once put together, they have worked well, it was just an absolute nightmare to figure all of it out, not to mention probably 6 times going there and back, and probably a total of 12 or more hours of my time dealing with their mistakes. For the flooring, I think it depends on your situation. I’d love to do the plastic tile flooring, but we do a lot of disassembly, so sand would go through them and we’d have to pick up the entire flooring to clean it, likely monthly. I think what we’ll end up doing is more of a rubber “gym” flooring if you will in the work bays. This will be a nice soft surface, but will still be sweepable.. I think. The wash bay we are just going to leave for now, unless I can figure out some other ideas. I need to do some more research of flooring possibilities. It’s just so insanely expensive. That’s the idea of this series! Hopefully I can help you guys through some of these processes!